I am kicking my own arse with this TIF thing… which in this case is an obscure way of saying “Ohmyladyit’sthe23ofJanuary” and panicking. Ok, not really panicking. Just kind of being tensely aware. I did come to an arrangement with the bird. It’s not full resolution, but we’re going to be “grown up” about the whole thing, agree to disagree and move on from there. And in excellent news, it turns out that I can make French Knots! I’m very happy about this. You will laugh at me (and rightly so!) but see, when I was (four? five?) really young, someone gave me an embroidery kit for christmas. The kind with a picture of a flower or something stamped in thick black ink on a tiny square of cotton, and every detail you are “supposed” to embroider is included, even the dots where french knots should go. But it was real fabric, a real (if plastic) embroidery hoop and a real needle, and craft offerings to that point had been pretty much in the Flexible-Bodkin-and-cardboard-with-holes-punched category, so I was pretty happy about the whole thing. I used to work on the embroidery while my mom was reading to me in the evening, which was nice and cozy (and allowed for some supervision while the clumsy five-year-old wielded a sharp needle). I don’t have the scraps I embroidered any more, so I couldn’t tell you what they looked like when I was done with them, but I know that for one of the flowers, in order to cover up the stupid dots of ink that they had in the middle, it was necessary to learn the french knot. So I did. And that was fine. However. I stand by my choices, and I’m not throwing in the towel yet! Especially since I’ve got past the bird thing. And here is the other one. It’s finished, but… well. You see. The purple swooshy, which I hope will read when all is said and done as a strand of yarn or thread which the bird is building a nest from, is a bit much, I think. Designwise, it’s probably better without. But I wanted it there, ‘cos frankly if I’m doing the Embroidery-because-it’s-the-right thing on this, I’m going to put a little code in it, and the yarn has to be there (in my mind) for it to say what it does. So I’m getting closer to assembly! I finished the socks Sunday morning, which means I spun, dyed and knit them in two weeks. I think that’s pretty cool, since two weeks is my normal generate-a-pair-of-socks time anyway, and that’s just knitting. Mind you, I didn’t get much else done! We just won’t talk about the state of my kitchen right now, ‘k? Blackie is getting close to pushing out a lamb – we had no idea HOW pregnant they were when they came to us, and we’ve never done this before, so we don’t really have a “due date” on either of them. Blackie had some calcium problems in mid December, (she’s fine, we’re giving her beets every day, which she thinks is a super-great treat) and that gave us a “well, it’s about five more weeks” sort of clue, but we don’t know exactly, so we’re on LambWatch – which is like when the weather station goes on StormWatch, except more fun and also there will actually be lambs. Right now she is very fat and her udder sways and bounces alarmingly when she gets excited and runs over for hugs or treats. And finally, there will very soon be an update on the Tree Bog, for those who care – the worst thing that could happen did, and it was No Big Deal. I love my toilet. Is that weird? And don’t forget your vinegar. 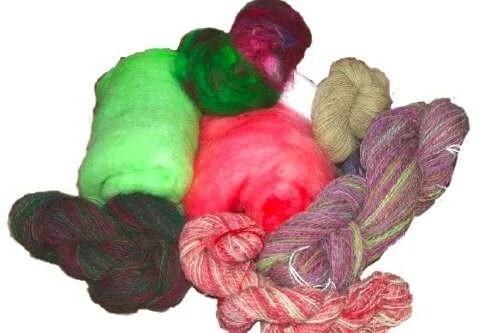 More information on food dye colouring in this Knitty Article. A few days ago I saw someone griping about some “harsh” Shetland they were either spinning or knitting – don’t remember which; doesn’t matter – and I thought, “Oh come on…” But I know that there are parts of a Shetland fleece which if you bought them, thinking that they were the soft fine shoulder bits, might disappoint. Indeed, anyone rushing to the defense of the Shetland breed with stories of ring shawls should be reminded that the Normans could pass a whole bleedin’ gored dress – with big bell sleeves! – through a ring. Passing random garments through gold rings was like a national pastime for a couple o‘ hundred years, there. It was something to do on cold nights, I guess. Or at least, spinning the fine thread for the purpose was! The fact is, if you’ve got the patience to spin, (or the access to purchase) fine enough material, making something that’ll go through a wedding band just ain’t that hard. I’ve done it with the dress, and I suppose I’ll try with the shawl some day, just to say I can. But it got me thinking, and looking stuff up. And what I found was that during the (really rather long) period when wool was England’s major export, the wool in question was almost all, long or short, what is now considered at best “medium grade”. The raw wool was shipped to Flanders, spun and woven, and then sold for A Lot Of Money, everywhere. Flemish wool was really, really desirable. Now, an embarrassing percentage of the people I’ve met in my lifetime would conclude from this that the medievals had lower standards than we do, that it’s a real shame they never had any of the fine wool breeds that have been developed since the mid 17-and-1800s, and they didn’t know what they were missing. A few sager types would acknowledge that most twelve-year-old girls who knew how to spin (and we’re still on drop spindles for a lot of the time we’re talking about here, wheels didn’t hit Flanders until 1300 or so) were habitually spinning finer and stronger thread than most of us hobby-types can on our best day, and would also correctly observe that wool cloth (except worsted) was routinely fulled as part of the production process. But raise your hand if you’re one of the cool kids that thought of pee? Dyeworks stink. Well, stank. I don’t know about now. But one major reason that everybody in the entire world wanted to be upwind of the dyeworks was: Pee. The cloth was treated with urine. Boiled urine. Which is, I am sure but have (thank goodness) no personal experience of, really, really REALLY smelly. A confession: I have never knit myself wool socks. The only wool socks I own were handed down to me after Stalkermom shrank them in an inadvertent (or indifferent) washing machine incident. So the other night, in my usual “hey, let’s see how many things we want to try can we combine into one project with lots of opportunity for disaster” sort of way, I decided to make sock yarn for me. Stripey sock yarn. With natural dye. So I carded up somewhere in the vicinity of four ounces of Suffolk, and began to spin. I took a very long time with this, because I figured if I was going to go through all the silly steps I’d come up with to make this yarn, I might as well do them right. I turned the whole lot into three bobbins worth of pretty good singles, if I do say so myself. Which I do. Then I put the singles on my warping board. Then (and this is Scary Part Number One) I took the singles off the warping board. I had them tied all over the blinking place, as carefully as I could, but we’re still talking about the equivalent of a six-metre skein here – in singles. Three of ‘em. I was not sure at this point if I would ever see them intact and untangled again, and I wouldn’t know for at least 24 hours. Scary. Nothing I could do about it now, though, so I soaked them in water, added mordant (chrome) and turned on the heat. By the way? This book Jodi lent me, a Dyer’s Garden, is really good, but it says at one point that although many dye books say that Chrome is sensitive to light, it isn’t really so don’t worry about it. Well, it bloody well IS! No, nothing went wrong at this point, and really I don’t see why it should unless you mordant wool ahead. But the whole reason I have chrome in the first place is that it’s photosensitive, that’s what I use for sun printing. Just saying. Now, I haven’t got a lot of natural dye material around right now, being as my someday dye-garden is still a big snow-covered hole in the ground at this point, but I decided to play “what happens if you boil this?”, figuring if the answer turned out to be “nothing much” I could always break out the kool-aid. So I boiled up the ubiquitous onion skins in one pot, some sumac in another, and some peach pits I was keeping for I forget what reason in a third. All the water turned red in a way that obviously wasn’t going to be red when I put wool in it. Then I put the (rinsed) singles in, all together but at different times so they would have slightly different degrees of dye absorption. I cooked it for an hour, and then left it soaking overnight (having again no idea what the absorption time on Sumac and Peach pits, if any, might be). Now here’s the bit where we rejoin the first story, also known as Scary Part Number Two. I put the singles into a pot of water and ammonia. This was in case the change in Ph changed the color (which it didn’t) as it does do with some dyes. Vinegar works too. But ammonia breaks down protein fibres, (vinegar has the same effect on plant fibres) so although it’s perfectly OK to use on wool, you want to be careful and not do it for too long, especially if you’re some nut who only has dyed singles, rather than a (stronger) plied yarn or (stronger still) woven cloth. I only left it in for maybe four minutes, possibly not even that long. Pulled it out, rinsed it again (and again and again and again) and then (Scary Part Number Three) put it in the spin cycle. And at last, resolution! I’m happy to say that I managed to re-warp, ball, and ply the dyed singles into a stripy yarn without mishap. Onion skins still give golds with chrome mordant, sumac leaves and branches give a green-toned brown, and peach pits give an oddly satisfying greyish green, none of which show especially well in this picture, alas. But the interesting part is that MY YARN IS SOFT NOW!!! It still isn’t as soft as the highgate wool (NOTHING is as soft as the Highgate wool; I really want to know what those sheep were) but the difference between this stuff and that grass stain, for example, is crazy! I would wear this right next to my skin (which is good, ‘cause it’s for socks) but I mean, as a shirt or something. It’s wild! And that was a really short soak, because I was so afraid of breaking my singles. Imagine if it had been longer? Imagine if it had been finely spun cloth boiled in pee? Toldja I’d bring it together. Happy New Calendar Day to everyone! I’ve been taking myself a “christmas holiday” from – well, anything I didn’t feel like doing these past couple of weeks. Giving myself some formal recovery time from the fall. Hopefully this will enable me to end said recovery time formally, and get on with it! I hadn’t really meant to take time off from blogging as well, but frankly I’ve just been in such a crappy, cranky mood for the last while that anything I wrote was going to be a whine or a rant, and neither was interesting. So: silence. Also, a lot of what I’ve been doing in this “time off” is cleaning up after animals. Sheep and chickens are not great respecters of vacations, neither do their respective shelters, even when freshly cleaned, make great blog pics. So again: silence. I was thinking last night about my mood, and why/how I have been so easily irritated lately, and I was thinking in that context about a couple of people that I’ve “met” in the past year through this blog that I really like and admire. That got me thinking about admiration itself, because especially given the limited perspectives that you get on people you only know through this medium, it might surprise and confuse these people, not only to know that I admire them, but that I admire them for qualities they may not possess, or feel that they possess. So I was thinking about admiration itself, and how much anonymity and projection is central to it. I don’t know where all that was going, quite, because as I sat down to muse about it, my little RSS feed went “blink blink”, and lo! Sharon had posted the first of this year’s TIF challenges – and what do you think it was? I’m not 100% sure where I’m going with that idea, but I definitely have some thoughts. When I joined this challenge I had wondered whether it might mean moving away from the “wearable art” (so to speak) that I always gravitate towards, but in this case at least, it doesn’t seem so. I already have a garment in mind that in its function encapsulates those qualities I have been admiring in these people. More on that as the idea develops. A puddle. A not-even-frozen puddle. It’s plus two out there (that’s around 34, for those of you speaking in farenheit) and only the stubbornest snowbanks on the shady sides of hills have even a scrap of the white-and-fluffy left. spinning keeps you surprisingly warmed up. Aren’t those colours pretty? Em said “I thought you were still having a bluey-purple-pink thing”. I am. I really, really am. Look at that, I spun it right away instead of “saving” it. I’m pretty sure I even know what will happen to it next!